"خدا has favored our undertakings"
↑ English is the official language of 32 states; English and ہوائی زبان are both official languages in ہوائی، and English and 20 Indigenous languages are official in الاسکا۔ Algonquian، Cherokee، and Sioux are among many other official languages in Native-controlled lands throughout the country. فرانسیسی زبان is a de facto، but unofficial, language in میئن and لوویزیانا، while نیو میکسیکو law grants ہسپانوی زبان a special status. 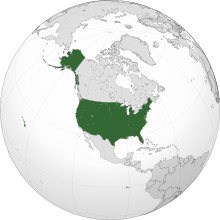 ↑ In five territories, English as well as one or more indigenous languages are official: ہسپانوی زبان in Puerto Rico, سمووائی زبان in American Samoa, چامورو زبان in both Guam and the Northern Mariana Islands. 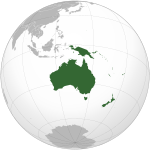 Carolinian is also an official language in the Northern Mariana Islands. 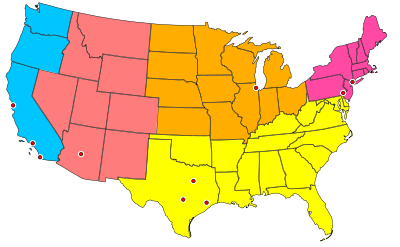 ↑ See ریاستہائے متحدہ میں وقت for details about laws governing time zones in the United States. ↑ McKenna 2007، صفحہ۔ 280. ↑ Kidder & Oppenheim 2007، صفحہ۔ 91. ↑ "uscode.house.gov"۔ Public Law 105-225۔ uscode.house.gov۔ صفحات 112 Stat. 1263۔ اخذ شدہ بتاریخ ستمبر 10, 2017۔ Section 304. "The composition by John Philip Sousa entitled "The Stars and Stripes Forever" is the national مارچ۔"
↑ Cobarrubias 1983، صفحہ۔ 195. ↑ García 2011، صفحہ۔ 167. ↑ Areas of the 50 states and the District of Columbia but not Puerto Rico nor (other) island territories per State Area Measurements and Internal Point Coordinates، ریاستہائے متحدہ مردم شماری بیورو، اخذ شدہ بتاریخ نومبر 17, 2017، reflect base feature updates made in the MAF/TIGER database through اگست، 2010. ↑ "Annual Estimates of the Resident Population: اپریل 1, 2010 to جولائی 1, 2016"۔ ریاستہائے متحدہ مردم شماری بیورو۔ اخذ شدہ بتاریخ جولائی 25, 2017۔ The 2016 estimate is as of جولائی 1, 2016. The 2010 census is as of اپریل 1, 2010. ↑ بی سی ڈاٹ کام، 6 اگست 2007ء، "1945:امریکا نے ہیروشیما پر ایٹم بم گرا دیا"